Edited by RerryR at 19:06, 02 Oct 2017. I liked blood lust. How much attack does it gain for every stack slalin? On expert, Bloodlust gives you +6 attack on hand to hand damage. With improved you will ged additional +5 only for the round in which you cast it. And then i think it was +3 attack for you creature if it kills a complete stack. Sorcery damage buff makes more sense if you have other mods activated which increase the life of creatures. - Reworked Mirth spell. Instead of Fly, now if creatures get moral and mirth was cast the deal extra damage based on your spell power. Only works in the round in which the creature had morale and only for attacking. - Cleanse now works much smoother (no time delay anymore). Very happy because it was difficult to code. - fixed some bugs with wrong arrays. The error with SN:M definitely gone now!!! Because i removed it. - Some bonuses worked without the spell beeing cast. E.g if the creature or artifact gave the buff. Now spell has to be cast in the battle to get bonus. -Reworked Fire Shield, now chance to summon Fire Element when attacking a unit with Fire Shield. Chance is 20% +SP from hero. Before it didn't work well. Edited by AlfWithCake at 00:24, 02 Oct 2017. 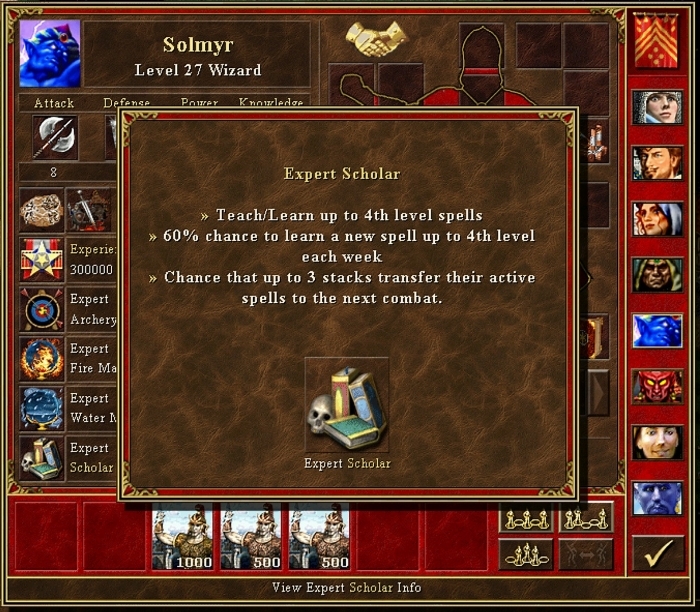 Is it possible to know level of spell with "spell trainer" mod? For now only indirectly. When in combat and spell levels up it says in battle log "Spell deals now 104% damage" Every level adds 4%. For buffs/debuffs it's a bit different. For Shield spell at level up, it will say. "Shield now reduces damage by 31%". So it's kind of logical. I agree it would be nice if you could rightclick in Spellbook and get the current level. Let's see what i can do. I don't know if you know about this, but if you cast slow 2 times with "spells improved" you will reduce enemy speed by 1 twice. After turn ends, enemies speed will be increased only by 1, not by 2. YOu can get any enemy to have 1 speed. Same for blessing and haste and spells with similar effect. Edited by RerryR at 21:21, 11 Oct 2017. But still, i think i can fix it. Edited by RerryR at 19:06, 31 Oct 2017. The idea of the mod is to bring more variety to heroes choices. In WoG right now we clearly have some very strong heroes and some which are quite useless. Especially creature specialists are very good on big maps while magic heroes are boring or weak. The mod is not finished yet. In the end, I want to have unique heroes which are all equally strong or at least fun to play. Suggestions are welcome, I am still in development. Damage Spell Specialists - Are now able to cast their unique spell in combat more often. They get one free cast for every 10 or 20 levels, depending on the spell. This makes in my opinion much more sense than the auto-cast from WoG. Mysticism Specialists - They now gain Spell points for every battle won. Also when in combat they can empower their damage spells with Mana, increasing their damage. Intelligence Specialists - They are now able to add their current spell points to their magic damage. Buff/Debuff Spell Specialists - These spells will now stack in effect, making them much more useful (not ready yet). What this means for every spell I have to see. But I have some ideas. -Not sure how good it works together with "Script 39" Hero Specialization Boost (the auto-cast and stuff)"
But most of the things should already work pretty well. Edited by FfuzzyLogik at 10:24, 01 Nov 2017. Global modification : Just an idea, I suggest you add 1% damage for spells for all heroes. Its for sure stronger for magic heroes because 1% of high amount of damage is more powerful. But that's not logical to me that only mages heroes have this bonus and not might ones. For damage spell specialist, you mean one cast per turn ? So they have a "high" bonus for this spell and one more cast. If its without mana cost anymore, maybe its too strong ? For logic of "sorcery specialist" I suggest more a "chance to doble damage" for example than a chance to cast one other spell. For me they are specialist of damage spell, not "fast casters" no ? So maybe a probability of doble damage or some increase of damage of a random percentage of damage (depending on level) may be more fun ? For mysticism, I suggest they got a probability to recover few mana points for every spell cast and may drain a few spell points for ennemy high cost spell (like familiar but as "probability"). Edited by phe at 11:36, 01 Nov 2017. Edited by RerryR at 19:48, 01 Nov 2017. Well I'm using WoG Heroes Specialisation Boost and their Creature specialists are really strong so I think they don't need to be any stronger. And I want to archive that they play differently. If i buff their magic damage too, why would i pick a mage hero than if the other is the same but has a very strong creature? Little example: Frost Bolt specialist with level 15 will be able to cast 1 extra Frost Bolt per combat at any time(not per turn). With level 25 they will be able to cast two extra Frost Bolts. They do cost Mana. Ofc it has to be a bit different for Solomyr he will have to reach a higher level to get extra cast. The tower commander already recovers Spell Points from combat, i didn't want to just clone that ability. The drain from the enemy is a good idea, I will think about it. But with endless spell points, the heroes would still not be interesting to play in my opinion. So i decided for the possibility to "empower" spells during combat with Mana. Yes, I will take care of that. The aim is that they are also good in late game. It will be something which scales with level and it should feel unique to play with that hero. Like Ulands Cure Spell. E.g: Heroes with Fortune specialty: "Casts Fortune with increased effect, based on hero level compared to the level of the target unit..."
Well, this is barely useful or fun to play with. It could be changed to Heroes with that Fortune specialty will deal 1% more damage per level when doing a luck hit. @phe the 1 point more mana per day sounds reasonable, i will see what i can do. I would propose something like chain lightning immunity for Solmyr, so he can actually depend on casting chain lightning often enough, as you can easily kill your own creatures. Next version of the mod will come on the weekend but I'm not finished yet, still struggling with the whole concept. Needs to be better. Edited by RerryR at 22:07, 16 Jan 2018. 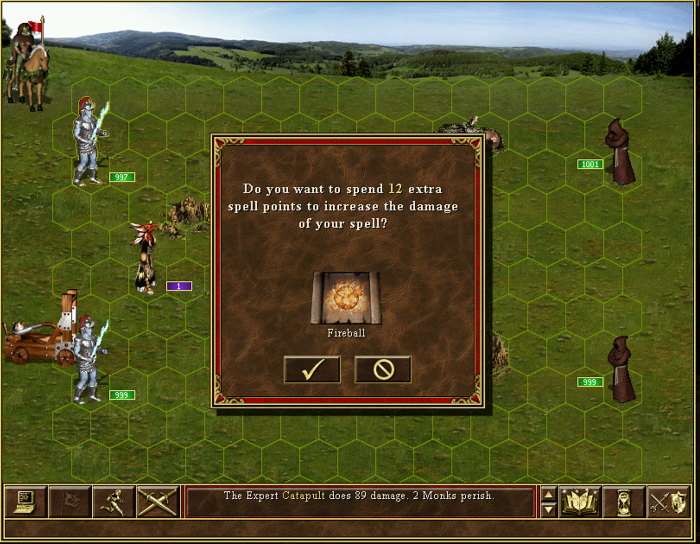 Transferred spells last only for the first round in the new combat (duration 1), but they keep their cast power. With Expert Scholar up to three stacks can take spells to the next combat. Chance is higher if you have 7 stacks in your army. If spells were transferred you will hear a little prayer sound at the beginning of the battle. I haven't tested it too much, I will do that with my next playthrough, so feel free to report if something is not working correctly. The Mod Magic Specialists replaces the Mod "Reworked Magic Specialists". While the idea to rework ALL magic heroes is nice and intriguing I'm under the impression this work would be wasted. No matter how good it would be, you would never play an Eagle Eye or Stone Skin specialist as the main hero. So I just finished all spell and all sorcery specialists and removed the rest. General changes - All magic heroes gain 1% Spell damage per level. For example, Death Knights are considered warrior heroes while Necromancers are considered as magic class heroes. Damage Spell Specialists - Are now able to cast their unique spell in combat more often. They get one free cast for every "few" levels, depending on the spell. Check hero specialty description. Unique spells also have a chance to deal 50% more damage which is equal hero's level. Sorcery Specialists - They now have a chance to get additional casts in combat. If they get an extra cast they can cast an additional damage spell (only damage, no buff/debuff spells) from their spellbook. Chance and casting is dependant on hero level. Check hero specialty description in-game. This is basically what I removed from the Magic Specialists mod and is now stand alone. But it works a little bit different now. Activating this Mod gives you a chance to boost the damage of your spells by spending extra spell points while in combat. The chance to empower your spells is dependant on your total "Magic Knowledge". Each magic secondary skill adds 10% chance to boost your spells. The following SS are considered as magic skills: Wisdom, Sorcery, Intelligence, Scholar, Mysticism, Eagle Eye and Fire Water Air Earth Magic. With secret and hidden skills you can reach 100% chance of success. When reaching 100% you will activate additional bonus! To check how much Magic Knowledge you have in total, just right click the knowledge symboly in the hero screen. The damage increase can go from 10% to 100% of spell damage and is chosen randomly every time. The Mana cost of boosting the damage will increase significantly over time but mostly is around 10% of your total spell points. Nice work, let me know when there is some final version, so I should permanently host it at wakeofgods.org/mods, where all Era mods are uploaded. Also advertise it on first page of era mods. Edited by RerryR at 17:08, 06 Jan 2018. The version 1.0 is only a couple of days away. So far only a problem with equipped Spell Scrolls remains, but fixing this is just a brain exercise. ok, pm me with the final version link, also it needs 4-6 screens to put in folder, an icon (optional) and a readme.txt with features proposed, then I upload all this, thanks. Edited by xericsin at 17:02, 18 Jan 2018. @xericsin thanks for the hint. I assume you got an ERM error? I tried to reproduce it but couldn't get it. Anyway, better safe than sorry. Edited by xericsin at 16:19, 20 Jan 2018. Attacking monster on day 1, I got an error saying cannot find hero when monster units begin moving. With this extra check, no more error. I was referring to the Magic Specialist Mod. I was also wondering why your script was so short and a lot of content was missing, and now I realise the Magic Specialist Mod I downloaded is only a small part of all your mods. Adelaide's specialty hint has wrong picture. Spell num is 20, not 13. And you are using hero ID to determine the specialty hint. This could lead to wrong hints if hero specialty is modified by other mods. Anyway, doesn't really hurt. This line has a problem as well. BA:H will return -2 if no hero. So y4=-1 should be y4<0 or y4=-2. Why do you use HE-1 in battle? I think HE-1 will not be set as the hero who has just cast a spell. Edited by RerryR at 17:31, 20 Jan 2018. Yes it's just one part. The aim of the whole project is to make heroes which only take magic oriented secondary skills somehow more interesting and fun to play. But taste and playstyle are very different in heroes 3 and so I continued to release separated mods so everybody can pick what he likes and i will continue to do so in the future. And you are using hero ID to determine the specialty hint. This could lead to wrong hints if hero specialty is modified by other mods. Anyway, not a serious problem though. I'm aware of the problem with mods changing hero specialty but in fact, the mechanic would still work only the hero specialty description would be wrong because only there I use the hero ID. I plan to change that in the future. So it's more compatible. I also noticed the Magic specialists Mods is not perfectly compatible with Master of the Elements(double cast)Mod. I see if that can be changed later. Both correct and corrected. I re-uploaded the file. Improved Landmine is not working. I checked the erm, and I found these 2 lines. Is >< same as <>? What does &a|b mean? Did you mean &a/b or |a/b?